Hearty onion soup is frequently found on the winter table in Italy. In this take off, three types of onions are oven roasted first to bring out their sweet flavor, then tossed into the soup pot and simmered in broth. 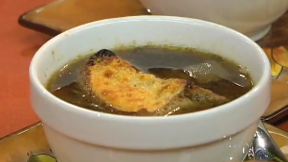 Watch Mary Ann Esposito make Roasted Onion Soup at CiaoItalia.com! Brush a rimmed baking sheet with the olive oil. Spread the onions and leeks on the tray; add the garlic, and whole sprigs of thyme. Sprinkle the salt and pepper over the tray. Bake for 30 minutes. Sprinkle the balsamic vinegar over the mixture and bake 5 minutes longer. Slowly pour the wine over the mixture and continue baking for an additional 35 minutes. Transfer the onion mixture and any liquid to a soup pot. Pour in the beef or vegetable stock, add the bay leaves and cheese rind. Bring the mixture to a boil, then reduce the heat to simmer and cook 30minutes. Stir in the parsley and thyme leaves. Correct seasoning. Preheat the broiler: Ladle the soup into individual oven-proof soup bowls. Place a slice of bread on top of each bowl. Sprinkle the grated cheese over the bread slices. Broil six inches away from the broiler element until the cheese melts and browns. Serve hot.